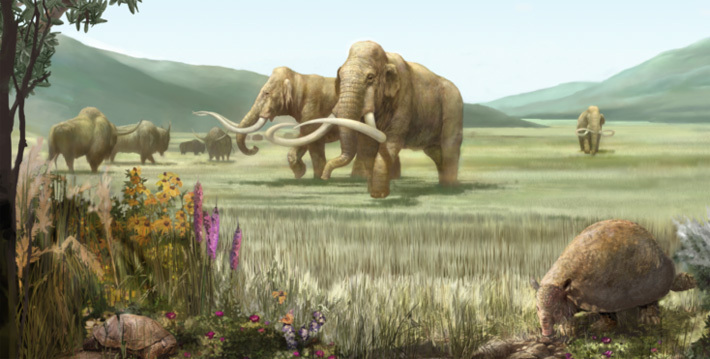 Lupe, the mammoth, lived during the Ice Ages 14,000 years ago. She is estimated to have been about six feet tall at the shoulder and weighed 3 tons. Lupe lived with her mother, aunts and cousins in the San Jose area. She ate on the lush grasslands that covered the ground at this time. Lupe was a young juvenile when she died. We do not know how she died. Do we know if Lupe was a girl mammoth? Paleontologists can tell whether a mammoth is a boy or girl from the shape of their hip bones. Unfortunately, the hip bones of this mammoth were not preserved well enough to tell whether it was a boy or a girl. Most people refer to animals as male. To promote gender equality, we have chosen to refer to Lupe as a girl.